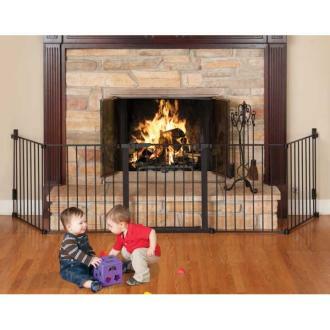 As a hardware mounted gate, it’s also ideal for use in any extra wide or odd shaped area; perfect for pet containment. All joints rotate; setting individual sections to the ideal angle, and then easily lock in place for a secure attachment. The unique handle design on the extra wide door applies Magnet-Lock Technology, a dual magnet design that automatically draws the door closed and guarantees it locks each and every time! The HearthGate also employs a hold feature that suspends the auto close function until the door is pushed closed. 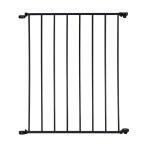 The original 5 piece HearthGate will fit a 6 foot hearth immediately; however, additional 9” and 24” sections can be purchased to add to the HearthGate to fit any desired length.